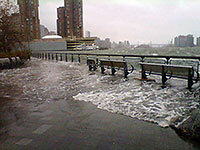 The Red Cross asked Disaster Psychiatry Outreach (DPO) for 100 volunteer psychiatrists to assist in the Rockaways, said Francine Cournos, M.D., a professor of clinical psychiatry at Columbia University and the New York County District Branch's disaster psychiatry liaison. "After September 11, we decided it was better for the district branch to work with DPO and the Red Cross rather than duplicate their infrastructure,” Cournos said in an interview. And like that prior tragedy, Hurricane Sandy will remind New Yorkers of how vulnerable their city is, Cournos noted. For more information about hurricanes and mental health, see Psychiatric News here. Also see Disaster Psychiatry: Readiness, Evaluation, and Treatment from American Psychiatric Publishing.